As Global Finance was going to press, Venezuela’s president Hugo Chávez was squaring up for a showdown with the United States. Chávez has been spoiling for a fight with the US pretty much ever since he was first elected as president in 1998, and it looks like oil giant Exxon Mobil’s attempt to persuade courts in the US, UK and other territories to freeze Venezuelan assets in response to the company’s ejection from Venezuela may have handed Chávez just the excuse he’s been looking for (see Milestone, page 10). 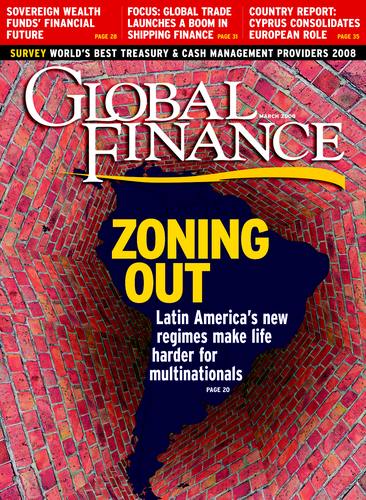 Chávez ’s threat to cut oil exports to the US if the asset freeze goes ahead might eventually prove to be simply macho posturing, but the underlying truth is that many Latin American nations can now afford to turn their backs on the US, as we find out in our cover story this month. With the growth of intra-regional trade pacts, the founding of the Banco del Sur—a clear attempt to squeeze out the World Bank and the IMF from Latin America—and the increase in trade with Asia and other global markets, Latin America has become sharply less reliant on its demanding neighbor to the north. It is a pattern that is unfolding across the planet as nations tap into the globalized economy. While talking heads in the US have recently been glibly dismissing the theory that many of the bigger emerging markets’ economies have begun to “decouple” from the US, Latin America’s apparent immunity to the US subprime contagion and to the threat of a US recession suggests there may be some truth to the theory. Globalization may have been initially driven and fueled by American corporations and consumers, but it has now achieved critical mass. Sure, the slowdown of the US economy will have a noticeable impact on the global economy, but it no longer holds true that when the US sneezes the rest of the world catches a cold. In fact, the rest of the world will probably sniffle a bit, then get back down to business. Much as the policymakers in Washington might want to cling to the belief that we’re all in this together—that what’s bad for the US is bad for the world, too—it is becoming increasingly clear that the United States is just one economic bloc among many. The curtain really is coming down on the era of US economic dominance, and, as it does, the rules by which the government, corporations and consumers alike play will change dramatically. Many US businesses have already cottoned on to this, seeing themselves as emerging market companies that just happen to be based in the US. The sooner the rest of the US corporate world accepts this new economic reality, the better.